I just wanted to provide you an update about your predictions - they have, as usual, come true!!! I started chanting the sloka you gave in your email below and in about 72 hours (from when I had started chanting the sloka in my mind), my professor, from the university where my computing account was sitting inactivated, contacted me and the paperwork started moving forward. Within about 2-3 days after that the process went through successfully, and my computing account was activated again! I was very pleasantly surprised! I cannot thank you enough for your priceless predictions and on-the-mark advice, no matter how complicated a situation is. Please accept my heartfelt gratitude and a big "THANK YOU" for all your help!!! - 12th March 2013. It is good.Wish you all the best.Help the people with your knowledge. Let me introduce my self. I am Sivarama Krishnan born and brought from South Tamil Nadu, son of Late S.Srinivasa iYer.I worked for Tata steels as General Manager (Chennai), now settled with my daughter in Italy. With your predictions & with your blessings my daughter & my son got married & doing well.As I am also belongs to satsangam, i decided to give a used vehicle to you for your personal use as respect for you. You are all doing a marvelous job in the Reiki field, giving correct healing.I pray god to give you good health to do more to our religion. Astrouniverse guided my husband through his permanent job search very well. It was a tough period during which they gave us strength spiritually and suggested remedies and shlokas based on his chart specifically.It took a year and half but they were very confident with the accurate time lines and predictions.Even now we are praying for success and they are continuing to guide us.We are very grateful for the mental peace.I would highly recommend them.Thank you very much. Astrouniverse is by far one of the fastest responsive Astrology websites we have in our times. They are quick and thorough on their explanations of questions asked. I find them very affordable compared to other websites. They are efficient. Also, their layout is very easily understandable because you can read it over and over since it is in a word format. Thank you AstroUniverse. " "I have been using Astrouniverse for many years now and I have found this service excellent and efficient. Not only are there responses quick, but they are accurate. I have also had Homas performed and they are great with this service too. The DVD quality is clear and the package arrives safely without anything broken. I recommend this website over any other. Thank you! " I consulted Astrouniverse regarding my career and job in this bad economy . They guided me with shlokas and energized Rudraksha which I wear and I got a job. I am very thankful to them. I continue saying the prayers for stability and success in my career in these tough times.Thank you." I'm very happy with the kind of service provided which included human touch and not just business point of view. The follow up clarifications and promptness in replies are just excellent. I will definitely look forward to you as my personal astrologer in future. I highly recommend their service. I would like to say my sincere thanks and gratitude for helping and guiding me in times of trouble.With your guidance things are beginning to improve slowly and steadily. Many thanks for your sincere and committed efforts in helping people and showing the right path. You had mentioned that things would brighten up around Feb 15. That did occur. Things had been very discouraging in the prior weeks; from 15th, more positive news began to flow in and it resulted in a few job offers and found job as per your predicted schedule. I just wanted to say that I have been really pleased with the accuracy of your horoscopes and advise. I have been viewing them for some time and not only are they accurate, but well written and always with something positive stated within its' content; I have had a number of astrological readings, even while traveling to India. But none compare to your accuracy. Your approach to reading astrological charts is practical and professional". One of the main questions I had was regarding when my green card would be approved and the astrologer had mentioned that it would be this year. Indeed, that's exactly what happened! I received my green card today!! I cannot thank him and your entire team enough for the wonderful service you have provided. You can count on me to remain your loyal customer. I am most grateful. Thanks again!!!". 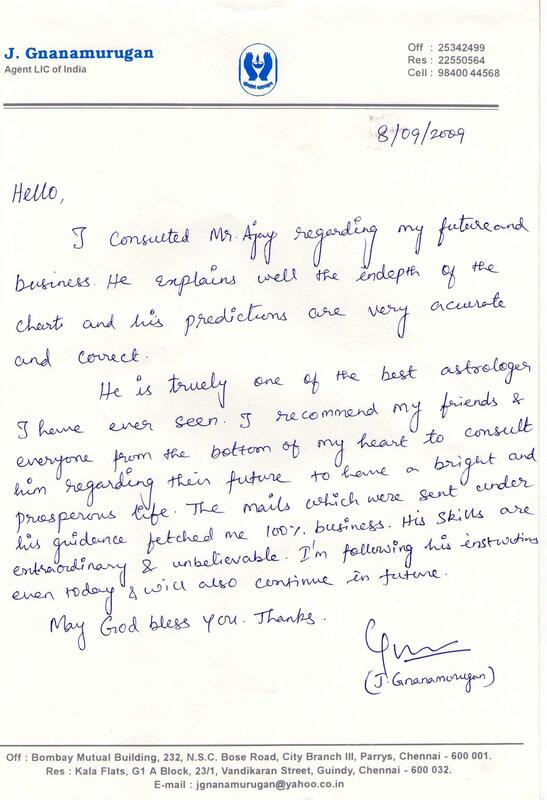 Its been pleasure to meet you where we had several queries on our careers and horoscope.All our queries are resolved to our satisfaction and the predictions made by you were marvellous". Thanks for your very prompt and the fastest reply I have ever got from any service provider." »» Subject: Reg. Career Report.